We traveled to Brazil this month for our next country in Around the World in 12 Dishes. I wrote an email to my Brazilian pen pals, that I’ve had for 23 years, and asked them for advice on a traditional dish my kids and I could make to represent their country. There was no hesitation in their answer. They told me there is a dessert called Brigadeiro, and they think 99% of kids love it. Well, you can add my children to that statistic also because they kept asking for more. 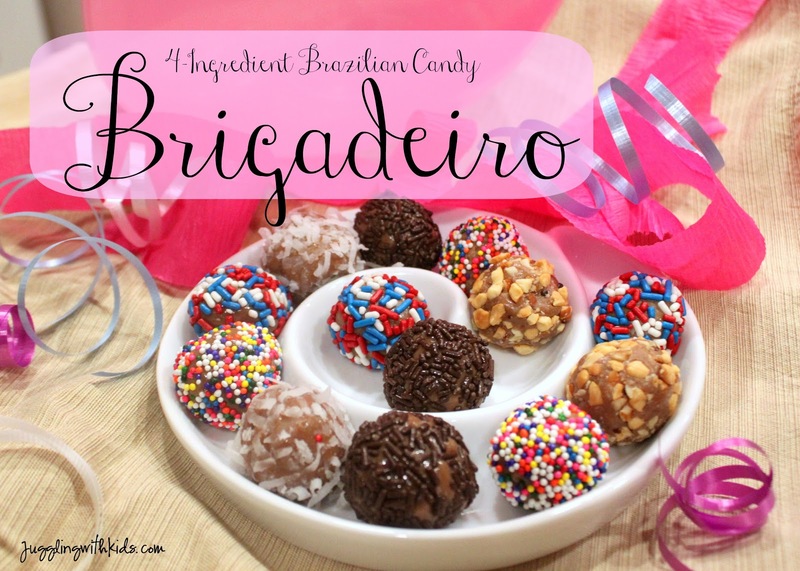 It is traditional to find Brigadeiro at birthday parties, as my pen pals told me “every birthday MUST have Brigadeiro!” They sent me this recipe from ifood.tv to help us get started. I did a little research first and read that condensed milk in the U.S. is a bit different from the Brazilian version. It is not as sweet, so it was recommend that I use Nesquik instead of unsweetened cocoa. Add 1 tablespoon butter (we used unsalted). Then add 3 tablespoons of Nesquik. Cook the mixture until it thickens enough to show the bottom of the pan while stirring. About 10 minutes. 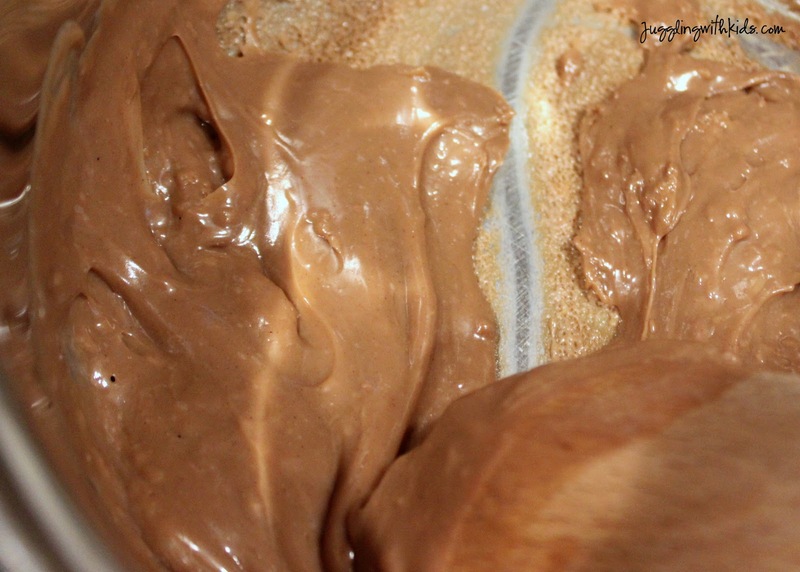 Pour the mixture into a lightly greased dish and let it cool to room temperature. My kids and I didn’t have a few hours to wait until it cooled, so I actually covered the dish and put it in the refrigerator over night. I then took it out the next day and let it sit for a few hours before we were ready to roll these into little balls. Roll them into bite size balls. I read some tips that you can grease your hands a little bit before rolling them into balls. We didn’t really have a problem with it sticking to our hands so we didn’t grease our hands, but I just wanted to give you that tip. Once you have rolled them into balls, roll them with sprinkles, nuts, coconut or anything you think would taste good. Crushed up cookies or mini M & M’s would be great too! These would make wonderful treats at any party. You can customize them in whatever color your party theme may be. We made some red, white and blue brigadeiro in celebration for the U.S. election that was going on. These were delicious! It almost tasted like eating milk chocolate caramel….however this was much softer and easier to eat than caramel (at least in my opinion). My favorite was putting salted peanuts on the brigadeiro as I like the combination of the salty and sweet flavors. My kids however went for the sprinkles! We’ll hope you’ll try these in your own home. 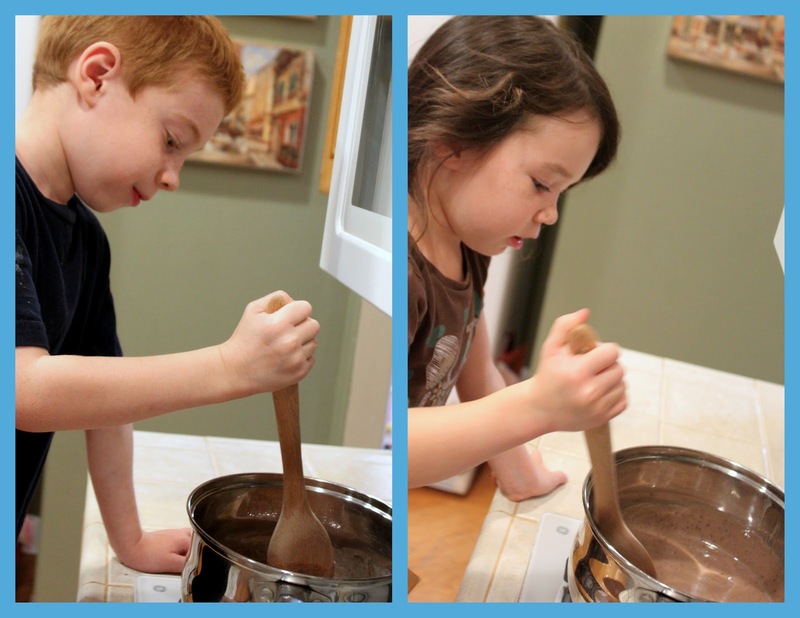 It’s relatively easy, takes few ingredients and it’s a great way to explore another countries traditions with your children! Yum!!! Love all the colors! :) How can anyone not like this dessert???? This looks like so much fun to create! A neighbor of mine recently brought over a treat very similiar to this who is from Brazil, can't wait to try to make it with my daughter! Can you provide more weblogs of you? I am a frequent audience you are this weblog on jugglingwithkids.com.It is a like able site for all of us.We are getting different kinds of opportunity by this site .I also support this site. Your considered details about…is so efficient. You adhere to me by Landscape painting methods are essential for anyone who desires to create their landscape artwork more efficient to the audience. Landscapes are representations of particular scenery that you would wish to represent via the fabric. Landscape paintings are portrayals of the different scenery that encompasses us. It can be a landscape of characteristics – a woodlands, a stream, the seaside, anything landscape that you can choose out in characteristics. It can also be a reflection of an city position – the industry, the series of structures, the cathedral.